So much has been and will be said about the upcoming 802.11 PHY amendment called 802.11ax (hereafter just “11ax”) that I felt I needed to chime in to counteract some of the expected poor marketing. This blog is not about what 802.11ax is, but rather is about what 802.11ax is not. If you read the last sentence twice, perhaps you already understand the problem that we face. 11ax is an enhancement to the 802.11 physical layer (PHY) that helps with using the limited channel space efficiently. I say “helps with” because it’s in no way a full solution to all of the problems we face. Further, what help we will get with 11ax will be doled out over multiple generations of chipsets and will primarily help when we have 11ax client devices. Here are a few things that 11ax isn’t. There’s no such thing as a Wi-Fi switch. Wi-Fi (802.11) is still half duplex. A much closer analogy is an Ethernet hub. Yes, a hub. Welcome to the year 1990. Most of the same limitations apply. 11ax supports 2.4GHz, but that means nothing. Yes, I said nothing. There are so many 2.4GHz Wi-Fi devices and interference sources that it boggles the mind. We only have a whopping 3 so-called “non-overlapping” channels to use, and 2.4GHz penetrates objects like crazy. 11ax won’t help you in 2.4GHz primarily because of the overwhelming number of legacy clients. If you don’t know what PCF mode is, thank your lucky stars. If you do, I apologize. I had no way of knowing. (Inside joke for early CWNEs) PCF mode was a mode whereby the AP (called a Point Coordinator) could seize control of the BSS for a time (PCF operation), and then relinquish control for a time (DCF operation). 11ax doesn’t work this way. 11ax still uses EDCA, and if you don’t know what that is, it’s time for a little bedtime reading. When the AP wins a TxOP, it has the ability to transmit downlink (DL) to as many as 9 clients (on a 20MHz channel) simultaneously or to cause up to 9 clients to transmit uplink (UL) (on a 20MHz channel) simultaneously. This channel access mechanism is called OFDMA. That’s more efficient than one-by-one-by-one-by-one (etc). HOWEVER…. those 9 (or fewer) clients MUST be 11ax clients. Legacy clients cannot participate in OFDMA because they don’t support it. So, how much more efficient is OFDMA? The answer depends on how many 11ax clients you have. Upgrade your clients to 11ax ASAP if you want ANY (yes, ANY) benefit from an 11ax infrastructure. 125KHz subcarrier spacing, so 256 subcarriers per 20MHz channel. 13.6uS symbol time, with 0.8uS guard interval time. 26, 52, 106, and 242 subcarrier Resource Units (RUs), which equates roughly to 2MHz, 4MHz, 8MHz, and 20MHz channels. This may cause some confusion at times because someone may ask the question, “what’s my data rate?” The answer depends on which RU you’re using during that 200, 357, or 421ms TxOP. 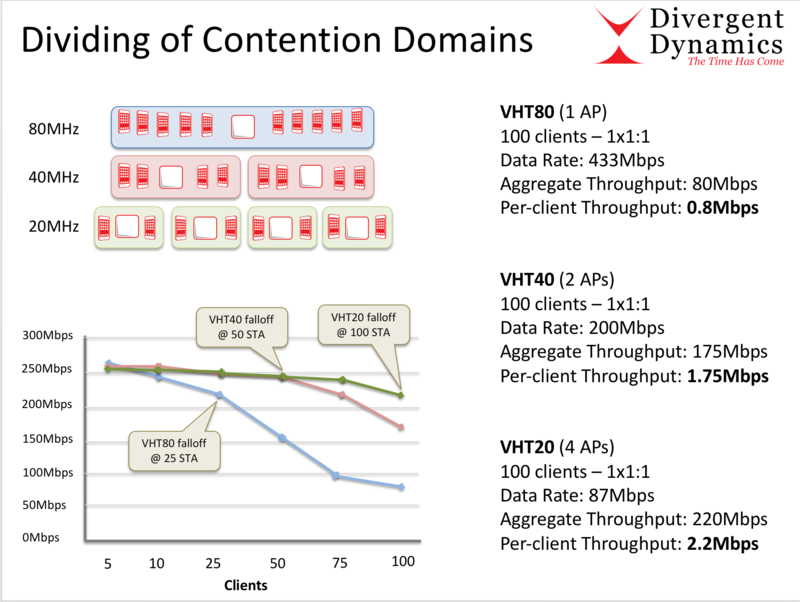 In a nutshell, your 11ax data rate is changing constantly, both in the UL and DL directions, depending on what RU the AP assigns to your client. The MCS table will expand to around 2544 data rates that operate like an automatic transmission. I’ve been asked this question at least 10 times. No new antennas will be required. 11ax APs will not, in any way, help the performance or range of your legacy (11a/b/g/n/ac) clients. 11ax APs will not be more sensitive, and if they were, that would be a bad thing. 11ac APs are already too sensitive. QCA is saying they’re going to release 8×8:8 chipsets, and they (and the AP vendors who use their chipsets) will undoubtedly tout how awesome it is for recovering Wi-Fi signals. Anything past 4×4:4 is wasting power because the additional UL gains in sensitivity and reliability are miniscule. That’s why we don’t have 8×8:8 in Wave-2 11ac (which is in the 11ac amendment). MU-MIMO is dead. In fact, it was stillborn, even in 11ac. Useless. Pointless. Hopeless. See here. The overhead of channel sounding is insanely high. The gains from TxBF are very low, even in aggregate. Any chipset or AP vendor making a big bet on 11ax MU-MIMO has failed before they start. HaLow folks. Please don’t put your IoT junk on our 11ax networks. My good friend Dr. Hemant Chaskar wrote a nice piece here. That said, I already know that, “if you build it, they will come.” It’s the wild west of Wi-Fi. You’re thinking, “OK, don’t be silly”, but honestly, AP vendors market each new PHY as though it were a cure for cancer…and well, everything else also. They’re being obviously dishonest, and a bit silly as well. IF you can upgrade your clients to 11ax sooner rather than later, an 11ax infrastructure may add capacity to your network. I say “may” because 95% of the Wi-Fi networks I see are so poorly designed and deployed that nothing would help them short of starting over from scratch. That’s not metaphor or exaggeration. As you narrow your channels, you increase the number of contention domains, which in-turn drives up per-client throughput. That’s the point of using 20MHz channels in the enterprise, rather than 40MHz or 80MHz channels. It’s also the point of using OFDMA. Here’s a slide from my 11ax courseware, the data from which was provided by Aruba Networks. I hope it drives home the point. If 20MHz is better than 40MHz or 80MHz for increasing contention domains, then 8MHz, 4MHz, and 2MHz is even better.